Previously, content from the ODI Summit reached more than 1.6 million individual accounts across all online platforms. It has been covered by major publications such as the BBC, The Times, and Economist, been live-streamed to international viewers and trended on Twitter. Join the ODI as a member and get 35% off your super early bird ODI Summit ticket and access to an exclusive ODI Members area. You’ll also receive opportunities to network, join free talks and courses, collaborate with us on projects and showcase your work throughout the year. Want to sponsor our conference? 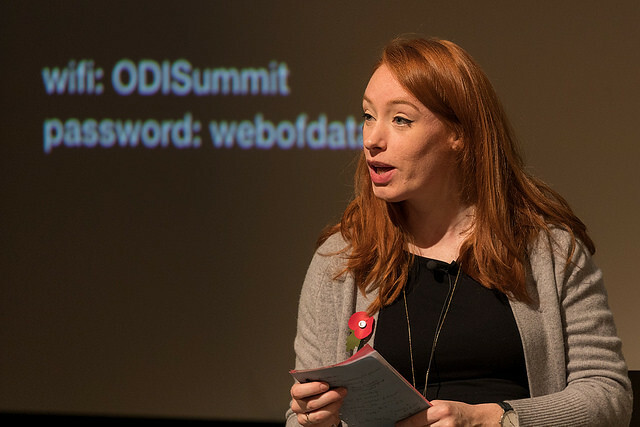 Show leadership in your sector, get your brand seen, get exposure to national media and support ethical data use by sponsoring the ODI Summit 2018. Epimorphics is a company specialising in linked data. We provide training, advice and consultancy to help you transform your data into linked data. We provide software and managed services to help you publish your linked data. We develop applications to help your clients get the most out of your data. Government, business and individuals rely on us to provide accurate and up-to-date geographic information. You will receive a refund of your fees paid to the Company if you cancel your registration 57 days or more before the Event, subject to an administration charge equivalent to 30% of the total amount of your fees plus VAT. The full amount of your fee remains payable in the event that your cancellation is 56 days or less before the Event or if you fail to attend the Event. All cancellations must be sent by email to [email protected] marked for the attention of Lorand Kiss. You acknowledge that the refund of your fees in accordance with this condition is your sole remedy in respect of any cancellation of your registration by you and all other liability is expressly excluded. Substitutions with employees from your organisation are welcome at any time but in all other respects delegate registrations are issued for your personal use only and cannot be shared with any person during the Event.